PHILADELPHIA, PA – October 10, 2017– Janney Montgomery Scott LLC (“Janney”), a leading full-service wealth management, financial services and investment banking firm headquartered in Philadelphia, PA, today announced the promotions of Jean E. Good, Alyssum M. Keefer, and Jonell L. Walker. All are in the firm’s Susquehanna Office Complex which includes the Lancaster and York branch offices. Good, previously Complex Operations Manager, was promoted to Assistant Branch Manager of Janney’s Lancaster branch office. Keefer, formerly Branch Operations Manager in the York branch office, was promoted to Satellite Branch Manager of the York Branch Office. Walker, formerly Registered Private Client Assistant, was promoted to Complex Supervisory Manager. Good, Keefer, and Walker report to Kevin L. Bradley, Senior Vice President, Complex Manager. Good joined Janney in 2007, serves on the firm’s Branch Operations Council, and is an active member of Janney’s Women’s Interactive Network. She is a graduate of Elizabethtown College and has earned the Accredited Asset Management SpecialistSM designation through the College of Financial Planning. Good is on the Board of Directors of Mom’s House of Lancaster. Keefer joined Janney in 2009 and, in addition to her role as Satellite Branch Manager, oversees client administration and practice management for the team of Smith, Mayer & Liddle. She is a graduate of Harrisburg Area Community College and Pennsylvania State University’s Harrisburg Campus. Walker joined Janney in 2013 as Registered Private Client Assistant and previously worked for the County of Lancaster for 24 years. She is a graduate of Franklin and Marshall College and has earned the advanced designation of Accredited Wealth Management AdvisorSM. 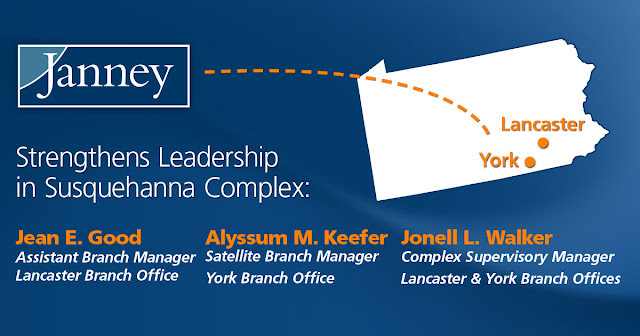 Janney’s Lancaster, PA branch office is located at 1650 Crooked Oak Drive, Suite 100, Lancaster, PA 17601. Janney’s York, PA branch office is located at 2315 North Susquehanna Trail, Suite A, York, PA 17404.